The natural plant polyphenol resveratrol present in some foods including grapes, wine, and peanuts, has been implicated in the inhibition, delay, and reversion of cellular events associated with heart diseases and tumorigenesis. Recent work has suggested that the cancer chemoprotective effect of the compound is primarily linked to its ability to induce cell division cycle arrest and apoptosis, the latter possibly through the activation of pro-apoptotic proteins such as Bax. The expression, subcellular localization, and importance of Bax for resveratrol-provoked apoptosis were assessed in human HCT116 colon carcinoma cells and derivatives with both bax alleles inactivated. Low to moderate concentrations of resveratrol induced co-localization of cellular Bax protein with mitochondria, collapse of the mitochondrial membrane potential, activation of caspases 3 and 9, and finally, apoptosis. In the absence of Bax, membrane potential collapse was delayed, and apoptosis was reduced but not absent. Resveratrol inhibited the formation of colonies by both HCT116 and HCT116 bax -/- cells. Resveratrol at physiological doses can induce a Bax-mediated and a Bax-independent mitochondrial apoptosis. Both can limit the ability of the cells to form colonies. Cancers claim at least six million lifes per annum worldwide, and the common and frequently therapy-resistant colon cancers are among the most notorious. Accordingly, natural food constituents capable of inhibiting, delaying or reversing events associated with tumor initiation, promotion, and progression have attracted much attention. The pharmacologically active trans form of the polyphenolic, antifungal phytoalexin resveratrol (3,5,4'-trihydroxy-trans-stilbene) is produced by more than 70 plant species and is reaching particularly high levels in grapes, peanuts and wine . A large number of publications in recent years has shown that physiological quantities of resveratrol can modulate multiple cellular pathways relevant for tumorigenesis, among them phase II drug metabolizing, cyclooxygenase, nitric oxide, DNA-synthesis, and inflammatory response, as well as cell survival, cell death and cell cycle pathways . The consensus of the many in vitro- and a limited number of in vivo-studies seems to be that micromolar quantities of the compound can not only counteract tumor initiation through anti-oxidant activities and the inhibition of enzymatic carcinogen conversion [2–4], or counteract tumor promotion through cyclooxygenase and hydroperoxidase inhibition [5, 6], but can affect tumor cell proliferation and survival through the inhibition of cell cycle, stimulation of differentiation, and induction of apoptosis [2–4]. The latter effects may be of particular relevance for the anti-tumorigenic activity of resveratrol , not least because the cell cycle/cell death machinery is specifically altered in many tumor cells and the targeting of this machinery by resveratrol opens up the possibility to specifically affect tumor cells and spare normal proliferating tissue. The compound indeed seems to possess some specificity for tumor cells . At the level of individual proliferating cells, resveratrol appears to act primarily though the inhibition of the cell cycle [8–14]. Although apoptosis may be provoked in normal, non-transformed proliferating cells exposed to high resveratrol concentrations , a temporary, reversible cell cycle arrest in G1 and G2 phase has been reported to result at low to moderate concentrations from activation of the p53 tumor suppressor and, subsequently, from the activation of the p21Cip1 inhibitor of cyclin-dependent kinases [14, 15]. In tumor cells however, p53 function is frequently lost, and consequently, cells usually arrest in S-phase instead of G1 or G2, probably due to the inhibition of DNA synthesis by resveratrol [16, 17]. Although this cell cycle arrest is also reversible, cells with altered cell cycle checkpoints can be more prone to apoptotic death [14, 15, 18]. The precise mechanisms through which resveratrol induces apoptosis are unknown. Together, the available data point to the existence of several apoptotic pathways that can be triggered by the compound, and to the existence of survival pathways that can be inhibited by it. For example, resveratrol has been documented to be able to induce apoptosis through the activation of p53 , but also through other mechanisms in wild-type p53-deficient tumor cells . Furthermore, the compound has been shown to inhibit the activation of NFkB transcription factor which serves as a survival factor in some cell types [20, 21]. Apoptosis following resveratrol treatment has been reported to be mediated, in dependence on cell type, through the death receptor  and mitochondrial pathways [14, 23]. Recent findings make the involvement of the death receptor pathway questionable though [24, 25]. For instance, dominant-negative inhibition of this pathway failed to block apoptosis induction by a resveratrol analog . The pro-apoptotic Bax protein is one of the major players in the mitochondrion form of apoptosis , and mitochondria-mediated cell death induced by resveratrol may involve stimulation of the expression of the bax gene by p53 or other transcription factors [10, 14, 27, 28]. However, mitochondria-mediated cell death may also involve down-modulation of Bax-antagonists such as Bcl-XL or Bcl-2 , or the translocation of Bax from the cytosol to mitochondria ( and discussion therein). Since Bax was activated moderately or weakly under resveratrol in some cell types [10, 14, 27], or was activated only at high drug concentrations although apoptosis was observed at low concentrations as well , the present work was designed to address the role of Bax in colon tumor cell apoptosis more directly by studying the effect of the drug on the human HCT116 colon carcinoma cell line and a derivative in which both bax alleles were disrupted by spontaneous frameshift mutation and targeted homologous recombination . Resveratrol was purchased from Alexis (San Diego, CA). JC-1 and MitoTracker Red were obtained from Molecular Probes (Eugene, OR). ADR, 5-FU, and PI were provided by Sigma (St. Louis, MO). Rabbit polyclonal antibodies Bax N-20, Bcl-XL S-18, Bcl-2 N-19, and cytochrome b were from Santa Cruz Biotechnology (Santa Cruz, CA). Rabbit polyclonal caspase 3 antibody and mouse monoclonal caspase 8 and Bax 6A7 antibodies were purchased from Transduction Laboratories/Pharmingen (San Diego, CA). The rabbit polyclonal caspase 9 antibody detecting a 36 kDa cleavage product of pro-caspase 9 was from BioVision (Mountain View, CA). Peroxidase-conjugated anti-rabbit and anti-mouse secondary antibodies, the β-actin and FITC-labeled anti-mouse monoclonal antibodies, and a liquid alkaline phosphatase detection kit were from Sigma. Stock solutions of resveratrol and Mitotracker Red were prepared in DMSO; JC-1 was dissolved in methanol; ADR, 5-FU, and PI stocks were prepared in water. The HCT116 cells and derivatives were cultured as monolayers at 37°C in a humidified 7% CO2 atmosphere in McCoy's 5A medium supplemented with 10% FCS. HT29 cells were maintained in DMEM plus 10% FCS. Cells were seeded in 10 cm dishes to approx. 50% confluence at 24 h before resveratrol treatment. Protein extracts were prepared by lysing the cultures in 150 μl of lysis buffer heated to 90°C and containing 50 mM Tris-HCl (pH 6.8), 100 mM DTT, 2% SDS, and 20% glycerol. Samples containing 15 or 30 μg of total cellular protein were subjected to SDS-PAGE and transferred to a nitrocellulose membrane (Immobilon-P, Millipore, Bedford, MA). Membranes were then incubated overnight with antibodies directed against β-actin (1:5,000), Bax or cytochrome b (1:500), and Bcl-XL, Bcl-2, or one of the caspases (1:200, respectively). For signal detection, the secondary anti-mouse antibody was used at a dilution of 1:5,000, and the secondary anti-rabbit antibody at 1:1,000. For the preparation of subcellular fractions, at least 107 cells were scraped off the dishes, washed with PBS, suspended in 0.5 ml fractionation buffer (20 mM HEPES pH 7.5, 10 mM KCl, 1.5 mM MgCl2, 1 mM EGTA, 1 mM EDTA, 1 mM DTT, 0.1 mM PMSF, and 10 μg/ml each of leupeptin, aprotinin, and pepstatin A; supplemented with 250 mM sucrose), and homogenized by 10 strokes with a Dounce homogenizer. Nuclei and residual unlysed cells were pelleted at 750 g for 5 min (4°C). The high membrane (HM) fraction containing the mitochondria was harvested by centrifugation at 10,000 g for 15 min (4°C), and the supernatant was collected as the cytoplasmic fraction. The quality of all fractions was routinely tested by Western blotting with antibodies specific for nuclear proteins (anti-PCNA, p53, Rb), cytoplasmic proteins (anti-eIF4A, γ-tubulin), and mitochondrial proteins (anti-cytochrome oxidase, cytochrome b, c). To stain mitochondria (MT), cells were incubated with 250 nM Mitotracker Red in pre-warmed full medium for 30 min at 37°C and washed twice with full medium. For immunofluorescence, cells were washed in pre-warmed full medium and fixed for 15 min at 37°C in full medium containing 3.7% formaldehyde. The cells were then washed with PBS and permeabilized with 0.2% Triton X-100 in PBS for 5 min at room temperature. After repeated washes with PBS, cells were incubated with the primary anti-Bax antibodies (1:100) or appropriate controls for 1 h, washed twice with PBS, exposed to the secondary FITC-labeled anti-rabbit antibody (1:50), and finally examined with a Leitz fluorescence microscope. For membrane potential (ΔΨm) analysis, 2 × 105 cells were trypsinized, washed in pre-warmed medium, resuspended in McCoy's 5A medium supplemented with 0.2% FCS and JC-1 at 10 μg/ml, and incubated for 30 min at 37°C. The MT membrane potential is reflected by the quotient of red vs. green fluorescence measured by FACscanning; observation wavelengths were 530 nm for the green fluorescence and 585 nm for the red fluorescence. Cells were seeded in 6-well dishes to approx. 20 % confluency 24 h prior to resveratrol treatment. Asynchronously growing cultures were harvested by trypsinization, combined with the cells floating in the medium, washed with PBS, resuspended in 100 μl of 0.9% NaCl, squeezed through a 23.5 gauge needle into 0.9 ml of methanol and fixed for 30 min at -20°C. Cells were then repeatedly washed with PBS, resuspended in PBS supplemented with RNase A (25 μg/ml) at approx. 106 cells/ml, and stained with PI (25 μg/ml) for at least 1.5 h at 4°C in the dark. DNA fluorescence was measured with a Becton Dickinson FACScan (Bedford, MA); the Cell Quest software (Becton) was employed for data acquisition and analysis. Cells with a less-than-2n DNA content were apoptotic. For colony formation assays, initially 1.5×, 3×, and 4.5 × 103 live cells, counted with a CASY cell counter, were seeded in 25 cm2 tissue culture flasks and incubated for approx. 10 days until colonies formed. Since untreated bax -/- cultures were able to produce approx. 5× more colonies than the parental HCT116 cells, the numbers of seeded live cells were adjusted to produce equal colony numbers for the drug treatment experiments. Colonies were fixed with 0.25 % glutaraldehyde and stained with crystal violet. Human colorectal adenocarcinoma HCT116 is a poorly differentiated, growth factor-insensitive cell line deficient for hMLH1, a homologue of the bacterial Mut L protein and crucial component of DNA mismatch repair. The present study has made use primarily of HCT116 and the isogenic cell lines HCT116 p53-/- and HCT116 bax-/- derived from the parental line by targeted disruption of the p53 alleles or – in the case of the bax alleles – by a combination of spontaneous frameshift mutation and targeted disruption [31, 32]. HCT116 cells are responsive to a variety of stresses including DNA damage and spindle disruption, in part owing to the integrity of the wild-type p53 tumor suppressor pathway. For this reason, and since deregulated colon epithelial cells are the supposedly primary targets of natural cancer chemopreventive food constituents, this cell line has been frequently employed for the study of the molecular mechanisms of drug action. We have recently reported that the polyphenol resveratrol present in some foods can increase the steady-state levels of pro-apoptotic Bax protein and induce a mitochondria-mediated apoptosis in HCT116 cells independently of p53 . However, although Bax overproduction in response to 100 μM resveratrol was weak, and at lower drug doses (< 40 μM), undetectable (Figure 1A), doses of 10 to 20 μM were able to provoke significant apoptotic cell death (typically 9 to 25 % within 48 h vs. 5 % in mock-treated cultures, Figure 1B). We therefore asked what role, if any, Bax might have in the resveratrol-induced apoptosis of HCT116 cells. Expression of Bax and Bcl-XL, and apoptosis in human HCT116 colon carcinoma cells treated with low doses of resveratrol. Panel A: Total protein extracts (15 μg) of HCT116 cultures treated with 40 μM resveratrol or only DMSO (the solvent) were prepared at different times and analyzed by immunoblotting, employing the anti-Bax N20 (1:500) and anti-Bcl-XL antibodies (1:200). Note that at this low drug concentration, neither the level of Bax nor of Bcl-XL changed significantly. Panel B: FACS analyses on exponentially growing HCT116 cultures either mock-treated or treated with low doses of resveratrol for 48 h exhibited significant apoptosis in the drug-treated cultures. Error bars depict standard deviations of the means of five experiments. Previous work has documented that subtle shifts in the expression levels of Bax-interacting anti-apoptotic members of the Bcl-2 family of proteins can influence cell survival even when Bax levels are unchanged . We failed to detect changes of the steady-state levels of anti-apoptotic Bcl-XL in response to resveratrol (Figure 1A), and Bcl-2 was not detectably produced in HCT116 cells, indicating that the apoptotic sensitivity to resveratrol is not regulated via alterations in the Bax/Bcl-XL ratio. Recent work has furthermore shown that Bax levels do not always increase following apoptotic stimuli but that, instead, the occluded N-terminus of Bax may become exposed and the protein may then co-localize with the mitochondria ( and discussion therein). When mock-treated formaldehyde-fixed HCT116 cells, p53-deficient HCT116 p53 -/- cells, or HCT116 bax -/- cells were stained with anti-Bax-antibody 6A7 (Pharmingen/Transduction Labs) or an antibody raised against the conformation-sensitive N-terminus of Bax (N20, amino acids 11 to 30, Santa Cruz), both antibodies recognized a protein in the bax-positive HCT116 cells and produced a diffuse immunofluorescence signal (see Figure 2, mock-treated cultures), whereas no fluorescence was produced in the bax -/- or isotype controls (not shown), indicating that staining was specific and that the N-terminal epitope of at least a fraction of the Bax molecules was exposed in untreated HCT116 cells after standard fixation. Subcellular localization of Bax in drug-treated HCT116 cells and the p53-/- derivatives. Panel A: HCT116 and HCT116 p53-/- cultures were treated with 100 μM resveratrol (+) or mock-treated (-) and, after 24 h, stained with the mitochondria-specific dye Mitotracker Red (MT-red) and anti-Bax N-20 antibody (1:100). Note the punctuate, cytoplasmic stain with perinuclear concentration produced by the anti-Bax antibody in cells exposed to the drug, resembling the pattern produced by MT-red. 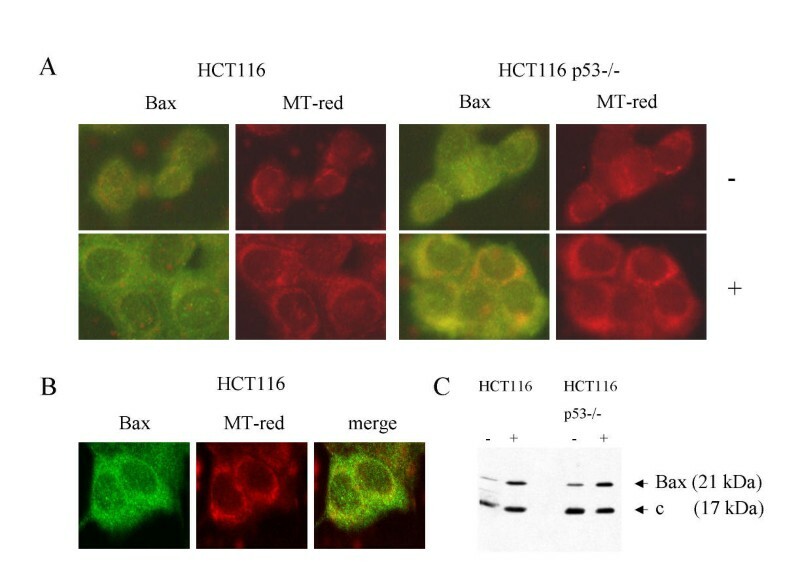 Panel B: Confocal microscopy of HCT116 cells treated with resveratrol for 24 h confirmed the co-localization of part of the Bax-produced fluorescence with the MT-red fluorescence. Panel C: Immunoblot analysis on 15 μg of total protein from the high membrane (mitochondrial) fraction of cells mock-treated (-) or drug-treated (+) for 24 h. Staining with Bax and cytochrome b (control) antibody (1:500) revealed the increase in Bax levels in the mitochondria fraction of resveratrol-treated cells. The co-localization of Bax with the mitochondria was not dependent on the presence of p53. Treatment of the cells with 100 μM resveratrol for 24 h resulted in the redistribution of Bax, regardless of p53-status, producing a distinctive, punctuate staining pattern in the cytosol with perinuclear concentration, resembling the pattern produced by the mitochondria-specific Mitotracker Red dye (Figure 2A). Confocal imaging confirmed that a fraction of the Bax immunofluorescence merged with the mitochondrial staining; however, a proportion of Bax appeared not to co-localize with the mitochondria (Figure 2B). Furthermore, when cultures were treated with resveratrol and were separated into cell fractions after 24 h, Bax protein accumulated in the high membrane fractions enriched for mitochondria, again regardless of p53-status (Figure 2C). Finally, when we studied the response to 100 μM resveratrol of human HT29 colon carcinoma cells expressing the dysfunctional p53-273H mutant, HT29 like HCT116 cells showed co-localization of Bax with mitochondria and underwent apoptotic cell death upon drug treatment (data not shown), demonstrating that this effect is not limited to one cell line and is indeed wild-type p53 independent. Together, these results demonstrate that active cellular Bax in colon cancer cells co-localizes with the mitochondria in response to resveratrol exposure, independently of the p53 tumor suppressor. Active Bax located at the mitochondria can mediate apoptosis , and we have recently reported that resveratrol can indeed trigger the mitochondrion form of death in HCT116 cells . Mitochondria-mediated apoptosis is often, though not always, associated with the collapse of the mitochondrial transmembrane potential ΔΨm as the result of leakiness of the inner mitochondrial membrane . To study whether the translocation of Bax correlates with ΔΨm changes, exponentially growing cultures of bax-positive and bax-negative cells were treated with 100 μM resveratrol or mock-treated for various times and were then incubated with the J aggregate-forming lipophilic cation JC-1, which as a monomer emits green fluorescence and in a reaction driven by ΔΨm assembles into a red fluorescence-emitting dimer. In accord with the sensitivity of HCT116 cells to resveratrol-induced apoptosis, and paralleling the co-localization of Bax to the mitochondria, ΔΨm rapidly dissipated, as indicated by the incremental increase in JC-1 green fluorescence and the lack of a corresponding increase in red fluoresence (Figure 3A). Remarkably, although stable for the first eight hours of drug treatment, the membrane potential of the bax -/- cells eventually also collapsed, indicating that a Bax-independent, mitochondria-mediated death with delayed kinetics can be triggered in HCT116 cells by resveratrol. To study this further, Western blot analyses with antibodies directed against caspases 3 and 9 were performed. Mitochondria-mediated apoptosis involves the cleavage of pro-caspase 9 into the 36 kDa active caspase 9, which then cleaves and thereby activates pro-caspase 3. 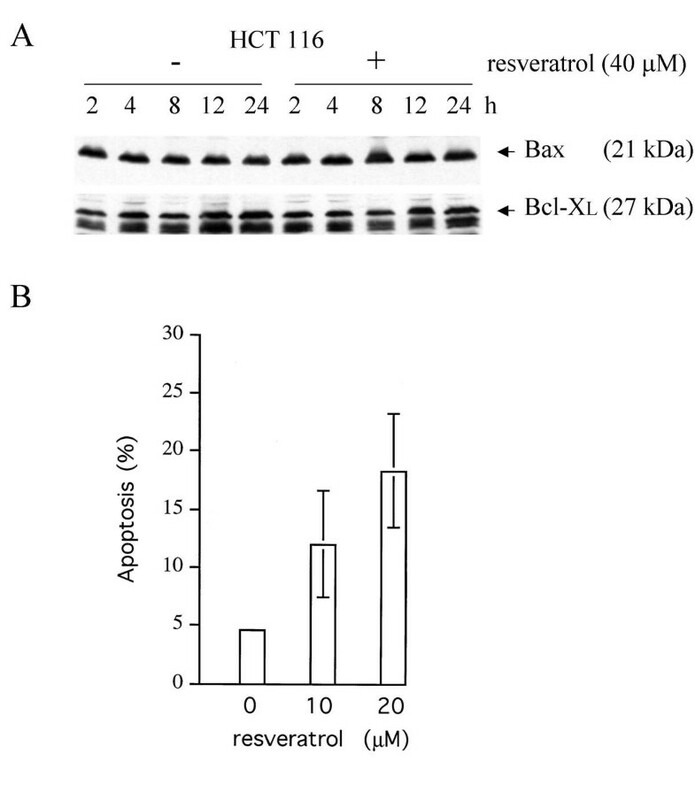 Resveratrol treatment (100 μM) resulted in the increase of active caspase 9 levels, and concomitantly, in the cleavage of pro-caspase 3, regardless of Bax-status (Figure 3B), supporting the suggestion that resvertrol can provoke both Bax-dependent and -independent, mitochondria- and caspase-mediated forms of apoptosis in HCT116 cells. As reported before , we failed to establish a role of caspase 8 in the resveratrol-provoked cell death, as neither caspase 8 activation in Western blot analyses nor inhibitory effects of the caspase 8 inhibitor IETH-CHO could be observed. Mitochondrial membrane potential changes and caspase activation. Panel A: Quotient of JC-1 red/green fluorescence as an indicator for the membrane potential ΔΨm in HCT116 cells and the bax-/- derivatives at different times after exposure to 100 μM resveratrol. Note that the absence of Bax delays but fails to completely inhibit membrane potential collapse. Standard deviations were derived from 4 experiments. Panel B: Detection of cleaved (active) caspases (casp) 9 and 3 in total protein extracts from parental and bax-deficient cells exposed to resveratrol. The anti-caspase antibodies were used at a dilution of 1:200. Staining with anti-β-actin is to show equal protein loading. We next asked how the survival of HCT116 and HCT116 bax -/- cultures is affected by resveratrol. When cells were incubated for 48 h in the presence of increasing concentrations of resveratrol and subsequently FACS-scanned for cell size and DNA content, a dose-dependent induction of apoptosis was observed in both cultures (Figure 4A). In HCT116 cultures, the rate of apoptosis increased to approximately 25 % at 20 μM resveratrol and plateaued thereafter. Although the bax-deficient cultures showed a similar dose-dependence of apoptosis, the rate of cell death was significantly lower. A time course over 96 h confirmed that resveratrol at 100 μM can provoke apoptosis in both cell lines, but much less efficiently in the bax -/- cells (Figure 4B), documenting that resveratrol-induced apoptosis in HCT116 cells is in part, but not entirely, dependent on Bax. Effect of resveratrol on the survival of the parental HCT116 cells and the bax -/- derivatives in culture. Panel A: Treatment of exponentially growing cultures with different doses of resveratrol for 48 h and quantitation of the numbers of cells with a sub-2n-DNA content by flow-cytometry revealed a dose-dependent increase of apoptosis in both cell lines and a much stronger apoptotic response in the cells expressing Bax, especially at low drug doses. Panel B: Time course of apoptosis in exponentially growing cultures either mock-treated or treated with 100 μM resveratrol, documenting the time-dependence of cell death induction. Note the reduced basal level of apoptosis in the bax -/- cultures. Error bars denote standard deviations of the means of four experiments. To assess whether the difference in FACS analysis in the apoptosis sensitivity between bax +/+ and bax -/- cells is meaningful, standard colony formation assays were performed. 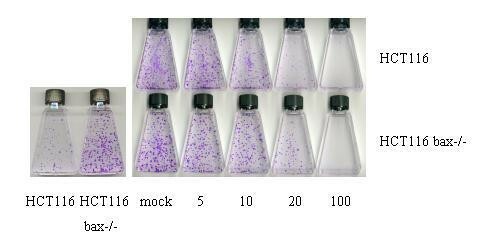 In a first set of tests, it was revealed that a short initial exposure of the cultures to 100 μM resveratrol for up to 6 h and removal of the drug thereafter, had no deleterious effect on colony formation (data not shown). This contrasted with the effects of damaging drugs such as adriamycin (0.34 μM) or 5-fluorouracil (375 μM), which inhibited colony formation under these conditions, and suggested that resveratrol acts primarily through the reversible inhibition of cellular factors. In the further study, cultures were therefore exposed to resveratrol for the duration of the assay. When equal numbers of live bax +/+ and bax -/- cells were seeded and mock-treated, bax -/- cells produced more colonies (Figure 5, left figure), consistent with the much lower basal level of cell death in these cultures (see Figure 4). To be able to compare the effect of resveratrol on colony formation in bax +/+ and -/- cultures, we therefore seeded numbers of live cells that gave rise to similar colony numbers and incubated all cultures for ten days in the presence of different concentrations of resveratrol. The drug decreased the numbers of colonies, and at the highest resveratrol concentration (100 μM), no colonies formed, regardless of Bax-status (Figure 5). At lower drug concentration (20 μM) however, more colonies formed consistently in the bax -/- cultures when compared with the bax +/+ cultures (62 +15 vs. 24 +11; average + SD from 10 flasks each), and the colonies were generally larger. We interpret this to reflect the lack of inhibition of colony formation by the Bax-dependent form of apoptosis in the bax -/- cultures. In summary, our data thus show that resveratrol at concentrations present in some foods can induce in HCT116 cells i) Bax-dependent, mitochondria-mediated apoptosis, regardless of p53-status and involving Bax co-localization with mitochondria, and ii) Bax-independent, mitochondria-mediated death. Both forms of apoptosis may independently limit the ability of the cells to produce colonies. Representative colony formation assay with HCT116 and HCT116 bax -/- cells. When 1.5 × 103 live cells, counted in a CASY cell counter, were seeded into 25 cm2 tissue culture flasks and were incubated for 10 days in the absence of drug, bax -/- cells produced more colonies (left figure), indicating the survival advantage per se of bax-deficiency. 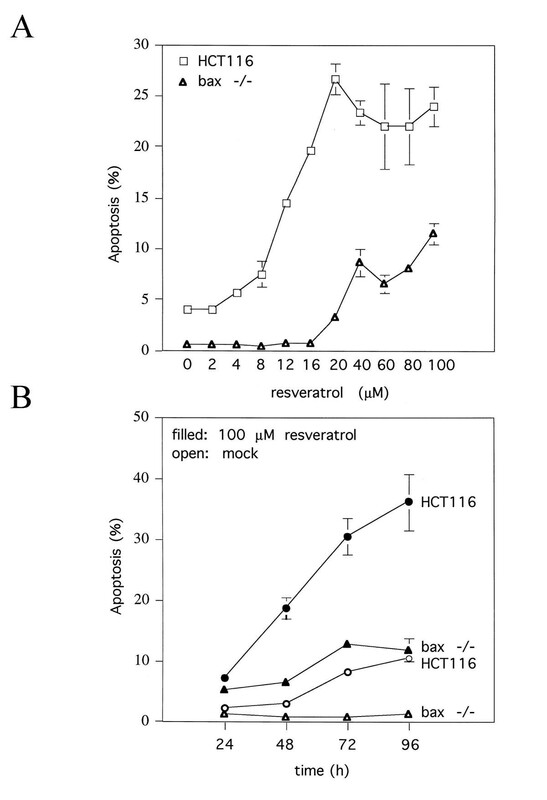 Right figure: 7.5 × 103 live HCT116 cells and 1.5 × 103 bax -/- cells were seeded into flasks and exposed to the solvent DMSO (mock) or resveratrol dissolved in DMSO, 24 h later. Colonies were stained with crystal violet. Resveratrol has been documented to cause apoptosis in a large number of tumor cell lines in vitro[8, 14, 19, 22, 33], in a rat model of azoxymethane induced colon carcinogenesis , and in a mouse model of familial adenomatous polyposis . The effects of the drug on cell survival are mediated through the activation of downstream effectors such as caspase 3 via two major initiator pathways, the death receptor and the mitochondrial pathway. Although the Fas death receptor pathway has been implicated in some forms of resveratrol-induced apoptosis [22, 35], many solid tumors seem to be affected exclusively through the mitochondrial pathway [14, 23], which intimately involves the Bcl-2 protein family members of cell survival regulators including the anti-apoptotic Bcl-2 and Bcl-XL, and the pro-apoptotic BH-123 protein Bax . Recent work has shown that Bax can be an important mediator of anticancer drug-induced cell death. For example, nonsteroidal anti-inflammatory drugs (NSAIDs) cause Bax-dependent apoptosis in human HCT116 colon carcinoma cells . In this system, the NSAID-provoked cell death was associated with a downregulation of Bax-antagonist Bcl-XL. In other model systems, Bax was overproduced in response to drugs, including resveratrol [10, 14]. We have shown in the present paper that a further Bax-dependent mechanism of resveratrol-induced apoptosis may be active – aside from alterations of the Bax:Bcl-XL or Bax:Bcl-2 ratios by Bax overproduction or antagonist downregulation: the subcellular redistribution of present Bax protein. Since Bax expression was stimulated only at high resveratrol concentrations while Bax translocation and mitochondria-mediated cell death were observed also at low concentrations, we asked what relevance Bax might have for the chemopreventive activity of the compound. Our results show that the lack of Bax in HCT116 colon carcinoma cells attenuates but fails to completely inhibit the resveratrol-induced mitochondrial form of apoptosis. This finding is in accord with a recent report showing that stable overexpression of Bax-antagonist Bcl-2 in U937 cells reduces, but does not prevent, resveratrol-provoked death . Along the same line, HCT116 bax -/- cells exhibited a reduced sensitivity to apoptosis induction by the anticancer drug 5-FU, but were not completely resistant like they were in response to the NSAID sulindac . One function of Bax and the related BH-123 protein Bak is the induction of mitochondrial outer membrane permeability, which eventually results in the activation of apoptosis-executing caspases. Cells from mice deficient for both Bax and Bak, but not cells deficient for one or the other only, are almost completely resistant to mitochondria-mediated apoptosis , suggesting that these proteins have redundant functions in this pathway. 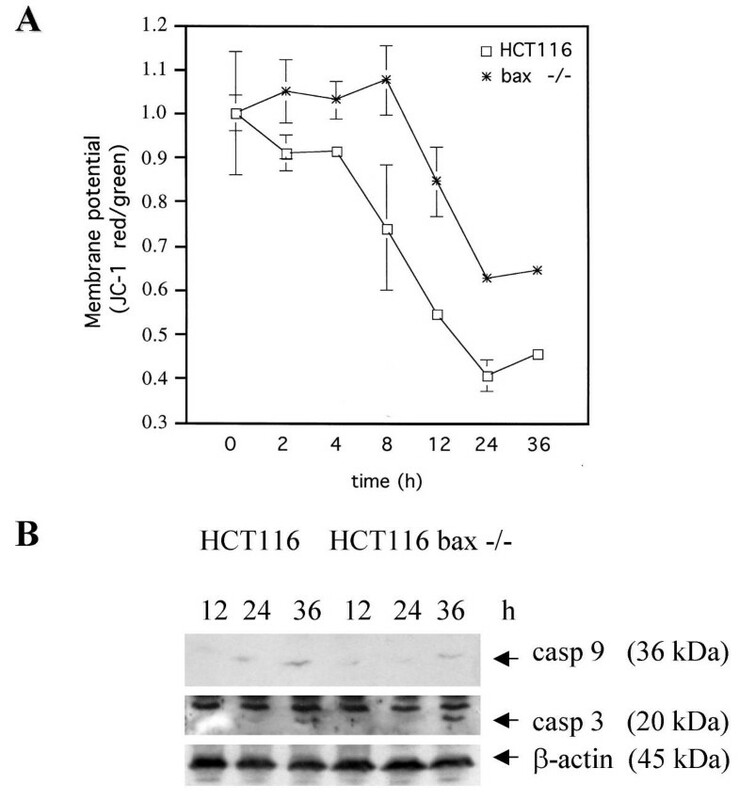 Bak is robustly expressed in HCT116 cells, and recent work has shown that bax-deficient HCT116 cells are more sensitive to apoptosis-provoking drugs such as ceramide than other bax-deficient cells . Whether Bak complements the lack of Bax in HCT116 bax -/- cells treated with resveratrol remains to be seen; however, recent observations with isolated rat mitochondria indicate that the drug is also able to contribute directly to the opening of the mitochondrial permeability transition pore complex and thereby induce the collapse of ΔΨm without involving the Bax/Bak proteins . Combined, the available data thus indicate that the chemopreventive agent resveratrol can affect the survival of tumor cells through several different pathways. Most colorectal tumor cell lines apparently show decreases in the ratio of the pro-apoptotic Bax and the anti-apoptotic Bcl-XL, and recent observations suggest that mutational inactivation of the bax gene may be frequent in the HNPCC-predisposition to colorectal cancer and may render these cancers resistant to important cancer chemopreventives such as the NSAIDs . The natural plant polyphenol resveratrol, in contrast, can trigger several different mitochondrial apoptosis pathways, and has actually been demonstrated to prevent the formation of colon tumors and reduce the formation of small intestinal tumors by 70% in a mouse model of familial adenomatous polyposis . One might therefore consider resveratrol or derivatives of it, possibly in combination with other drugs, as a chemopreventive approach to the management of patients with hereditary predispositions to colorectal cancer. Low to moderate doses of the natural cancer chemopreventive ingredient of some foods, resveratrol, induce mitochondrial apoptosis but fail to stimulate Bax expression or alter the Bax:Bcl-XL ratio in human HCT116 colon carcinoma cells. Instead, the compound induces co-localization of active Bax protein with the mitochondria. HCT116 cells with both bax alleles inactivated undergo mitochondrial apoptosis in response to resveratrol less efficiently than the parental cells, yet cell death through the mitochondrial pathway is not completely inhibited. Thus, resveratrol can activate Bax-dependent and -independent forms of mitochondrial apoptosis. Both forms can independently limit the formation of colonies. hereditary non-polyposis colorectal cancer, the commonest form of hereditary predisposition to colorectal cancer. We thank Bert Vogelstein for the HCT116 cell lines. This research was supported by a grant from the German Research Foundation (DFG) to K.R. MM-R conducted the protein expression, subcellular localization and apoptosis studies. HK participated in the design and coordination of the study. KR performed the colony formation assays and drafted the manuscript.